Discotots is fun-filled, with feel good music, disco lights, bubbles and lots of amazing props! Funky and upbeat music and movement classes for pre-schoolers that mums and tots can enjoy equally! Located across Cardiff and Penarth. We also provide children’s entertainment for charity events, weddings, christenings and playgroup/nursery parties.Welsh/bilingual parties also available. We offer contemporary, high energy music & movement classes for babies, toddlers and pre-schoolers (0-4 years) in Cardiff and Penarth. Discotots provide Pay As You Go and Seasonal Events throughout the year. Take a look at what we provide and join in the fun! 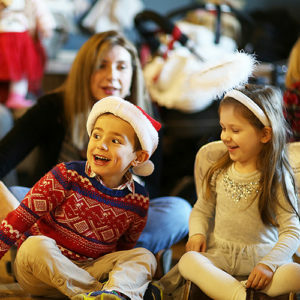 Discotots also provide sessions for playgroups and nurseries such as Christmas or Summer parties. Funky and upbeat music and movement classes for pre-schoolers that mums and tots can enjoy equally! Located across Cardiff and Penarth. We also provide children’s entertainment for charity events, weddings, christenings and playgroup/nursery parties. Welsh/bilingual parties also available. Our classes have won the prestigious Mums in the Know award for ‘Best Class for 2-4 Year Olds’. Our parties won the fabulous Netmums award for ‘Best Party Entertainer in Wales’. Want to try our classes but not sure if you want to commit to a full term? Trial sessions are available to book. Got any questions about our classes or parties? We are here to answer any queries you might have. Our team are committed to making sure you are informed and can decide what is right for your child/children. I can’t recommend this class enough. Having moved from Ealing in London I was struggling to find anything to replace the plethora of creative fun music/dance classes I used to take my son to. He was really missing them, as was I, but luckily after trying out a lot of things that just didn’t click we discovered Discotots. Amazing. My son absolutely loves it, perfect for his high energy and so much fun to take him to. He’s been able to fly around as a baby dragon with little wings (he was ecstatic doing this each week!) and pretend to put out fires like Fireman Sam. Bubbles, parachute play, singing, dancing its got it all. Becky is fantastic, all the kids love her and every week she is so enthusiastic. I never thought we’d find a class to replace the first ones we had grown so fond of but it’s now by far the best thing I take him to. Highlight of the week. Thank you Becky! Hannah from Discotots did our son’s 4th birthday party last weekend in Welsh (she also did his 3rd birthday party last year!). The children all loved her, she kept them entertained and happy for whole 2 hours – no mean feat with 35 kids ranging from 1 to 6 yrs old (!). She is enthusiastic, engaging and calm. I would highly recommend Hannah, especially if your looking for a Welsh medium party in Cardiff. Zoe was excellent also in helping to arrange all the details prior to the party. Diolch yn fawr i chi! Discotots is AMAZING! Been to loads of kids groups in SE England & about 20 in South Wales & this is by far the best of the lot! It combines the best of all the other groups you’ll find like musical instruments, lets pretend/drama, sensory, parachutes, bubbles, balls, puppets & then adds a whole lot more! This is enjoyable for the adults too as you can dance at the disco & its the only place I can take my 2.5 year old cheeky toddler to & completely relax as they dont have to stay sitting in in a circle for very long as its so interactive & can race about & do what they want. A real fun environment that you can all enjoy & bond. Zoe & Becky are the sweetest ladies ever & both look amazing too! Cant say enough about them! Miss this class & your missing out! 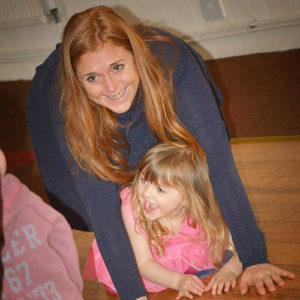 My daughter absolutely loves Discotots classes and adores Becky who makes the classes so fun and enjoyable. We enjoyed the classes so much, my daughter had a Discotots party for her 3rd birthday. Children of varying ages all enjoyed themselves and got involved. The classes are very happy and friendly making it equally enjoyable for mums and children! Would really recommend these classes. This class is in a word -brilliant. If you have an overactive toddler who doesn’t enjoy a structured class then this is for you. A combination of dancing, discolights, bubbles, singing and games always leaves my son squealing with delight! We have regularly gone to the classes over the last year and my daughter has thoroughly enjoyed them and the seasonal parties that Becky usually runs. She is full of energy and so good with all the children. We chose a Discotots party for her 3rd birthday which was joint with 2 others. Hannah who did the party was amazing, she was full of energy and was great with the kids. The party was money well spent and my daughter was dancing for the whole party. We had 3 very tired but happy 3yr olds at the end of the party. 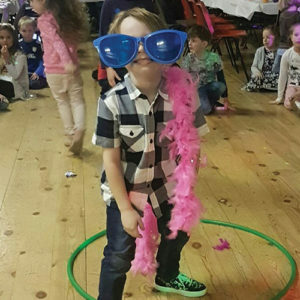 I would definitely recommend a discotots party which is tailored to the age group. My son and I have been attending Discotots for a few months now. I recommend it to all my mummy friends as my son loves it! We used to do another music class in Cardiff but I found it was to structured and the staff were too strict, they are toddlers after all. Discotots is a fun, friendly class with great music and props. Both of my children have attended Discotots classes and have hugely enjoyed themselves. In my opinion, Discotots is different to other pre-school music classes because of the range of movement and action songs, lots of funky tunes and the wonderful props – the ‘disco sticks’ are my favourite! My 2 year old spends much of the class squealing with glee and excitement and he loves the freedom of being able to run around as part of a structured class. Recommended!